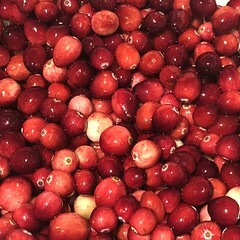 As autumn arrives and Thanksgiving approaches (first the Canadian, and then the American) my mom used to prepare this wonderful Cranberry Conserve. I’ve taken the torch and added a new dimension when I introduced lemon and lime to this already marvelous recipe. Every stage of making this is amazing, from zesting and slicing the citrus, crushing the walnuts to watching it at as it all melds together into one glistening pot of goodness. 1 cup granulated sugar (natural sugar is preferred) – taste, you may need to add more. 1. Zest. peal and slice (small pieces) the orange, lemon and lime. 2. Wash Cranberries before adding to a medium sized pot. 3. Cover the cranberries in the pot with the sugar, the orange, the lemon and the lime. Also add the orange juice (water) and mix well. 4. Set to medium-low heat, stir well while it comes to a simmer. 8. Finally, add the crushed walnuts (or almonds). Store in refrigerator or freeze for future use.